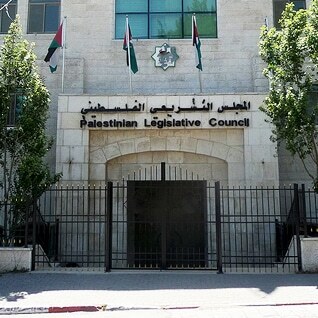 In order to strengthen the Palestinian administration – the Palestinian National Authority (PNA) – by a mandate from the people, elections were held on 20 January 1995, both for the office of president (for a four-year term) as well as for the 88 seats in the Palestinian Legislative Council (PLC), the PNA’s Parliament (for a four-year term). Palestinians aged eighteen or older were entitled to vote. The circumstances surrounding the elections gave a foreboding of the future political landscape in Palestine. PLO Chairman Yasser Arafat illegitimately encroached upon the proceedings by modifying procedures at the last minute, and by pushing forward as candidates certain members of his own Fatah organization who had returned with him from exile for the parlimentary elections. Leaders who had left their mark during the First Intifada, were dropped from the list of candidates (a number of them still managed to gain a seat by running as independent candidates during the elections). The elections were boycotted both by the left-wing PFLP and DFLP as well as the Islamic Hamas and the Islamic Jihad. These rejected the Oslo Peace Process that had led to the elections. Nevertheless, elections took place. For the election of the president, the West Bank and the Gaza Strip together formed one constituency. In order to be elected, a candidate needed half plus one of all the legitimate votes. Arafat won with 88.2 percent and thus became the first president of the PNA. The only rival candidate – Samiha Khalil, who had headed the important charity organization Ina’ash al-Usra (the Family Welfare Society) and was highly respected – won 11.5 percent of the votes. Different rules applied in the elections for the PLC. In order to guarantee minimum representation, six seats were assigned to Christians and one to the Samaritans; various candidates from their own circles had to compete for these seats. Furthermore, the West Bank and the Gaza Strip were divided up into sixteen districts (respectively eleven and five). Depending on the number of inhabitants, the districts were assigned a number of seats in the PLC, ranging from one up to twelve. In the event, the seat fell to the candidate or candidates who had won the most votes in a district – not necessarily the majority – according to the principle of the winner takes all. The introduction of a constituency voting system was an additional argument for the PFLP, the DFLP and for Hamas not to enter into the elections, since they, as small political formations, would only succeed in winning any seats if the electoral system was based upon proportional representation. Fatah won the elections and gained an absolute majority in the PLC, winning 55 of the 88 seats. Despite the boycott, the turnout was 71.7 percent. According to international observers, the elections were fair.